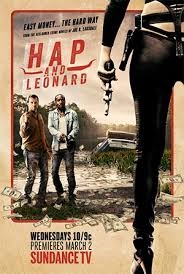 Hap and Leonard (Sundance) Rated TV-MA | What to Watch. Straight-laced Hap Collins spent time in prison in the 60’s rather than be drafted in the Vietnam War. Leonard Pine, a Vietnam vet, is Hap’s best friend. When Hap’s ex-wife shows up with a get rich plan, things turn bloody. Based on the stories by Joe R. Lansdale. Starring James Purefoy, Michael Kenneth Williams, Jimmi Simpson, Pollyanna McIntosh, Neil Sandilands. I’ve checked out the TV shows on Sundance for a few years, and I must say Sundance excels at both film and TV shows. The cast is strong and the story is darkly humorous. Like the 1980’s Texas backdrop, this show has an slow, easy pace, allowing the story to unfold comfortably without feeling rushed. It is worth a watch. This entry was posted in 2016, Based on a novel, Crime, Drama, Rated TV-MA, reviews, Sundance, Tv shows and tagged based on the stories, books, cast, ex-wife, few, friend, Hap and Leonard, James Purefoy, Jimmi Simpson, Joe R. Lansdale, Michael Kenneth Williams, movies, Neil Sandilands, plan, Pollyanna McIntosh, prison, rich, series, story, Sundance, trailer, TV series, Tv shows, Vet, vietnam, Vietnam War, war, worth, years. Bookmark the permalink. Pingback: New This Week on DVD, February 14, 2017 | What to Watch.